Governor Samuel Ortom of Benue State, on Wednesday, led other notable leaders before the joint Senate Committee on Police Affairs; National Security and Intelligence to present the Benue side of the story regarding the invasion and killing of innocent people by armed herdsmen. In company of the governor, was the state deputy Governor, Engr. 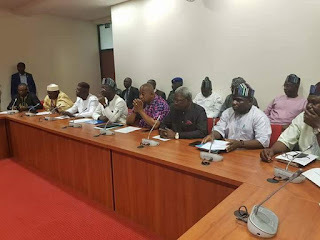 Benson Abounu, members of the National Assembly from Benue, state chairman of All Progressive Congress (APC), Comrade Abba Yaro, Chief of Staff to the Governor, Chief Terwase Obunde, former military administrator of Katsina state, Gen. Lawrence Onoja, as well as members of the state executive council.